Much like a traditional CSA, our Farm Share program allows Toddy Pond Farm customers the opportunity to financially support our farm in the "off-season". While our farm doesn't really have an off-season, our sales do slow down considerably in the winter months. This is where your support now can be especially beneficial! The Farm Share program is really very simple and designed to be as easy as possible for our customers to use. When you purchase a Farm Share, you will be given a Farm Share debit card (like the one pictured to the left), which you will be able to use at the Belfast Farmers' Market as well as our new farm store on Saturdays. Your Farm Share debit card never expires and can be reloaded with additional funds at any time you choose. Additionally if you are done with your card, we can re-use the physical plastic card (no waste!). For you, the shopping experience with your Farm Share card will be no different - select your purchases, pay with your card and the balance on your card will be adjusted. We can provide you with your remaining balance information at any time. Farm Share cards may be purchased at the Belfast Farmers' Market or at the farm with cash, check or credit/debit card - whichever works best for you. Or purchased directly online through our secure website shopping portal. 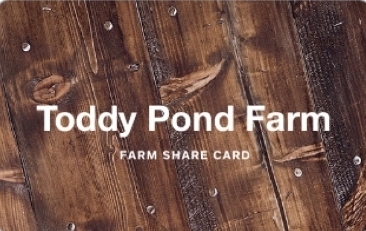 You may even purchase a Farm Share card and mail it to someone else as a gift. Instant hero status! Shop when it is convenient for you and for whatever you like that we have to offer - yogurt, kefir, cheeses, eggs, pork, beef, chicken, lamb, fermented vegetables, honey, and more! Shop with us at the Belfast Farmers' Market or come out to our new farm store on Saturdays - open 10 am to 5pm. Shop with the knowledge that your early Farm Share purchase allows for our winter farm operations and spring plans to move forward smoothly. Remember your Farm Share card never expires!